According to the IMF, Russia, Kazakhstan and Azerbaijan have boosted their gold reserves for a seventh consecutive month in April. Russia has purchased 269,000 troy ounces, with total reserves climbing to 31.8 million ounces. Kazakhstan bought 85,000, reaching four million ounces in reserves. “Russian and Kazakhstan Central Banks are of the opinion that the prices of gold in the future will continue to grow” Anatolii Baronin, director of Da Vinci Analytic Group told The BRICS Post. “At the same time, there are still risks of falling asset of reserves in securities and foreign exchange. “Therefore an increase of gold proportion is a logical policy, which will be maintained until the level of 15-20 per cent of reserves,” said Baronin. Gold holdings are being boosted amid prices plunging to a two-year low. 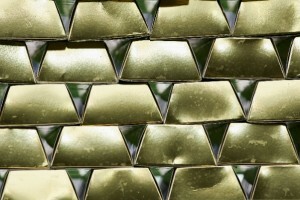 Gold prices slumped in April last year following the bearish mood among investors. At the same time Azerbaijan bought 32,000 ounces, increasing its reserves to 129,000 ounces. This is the fourth consecutive month that the Republic of Azerbaijan is purchasing gold, as in December it had no gold reserves at all. Central banks of the developing countries have taken advantage of lower prices to build their gold assets, as the plunge into the bearish market offers an opportunity to buy at low levels. “I think that today we can see transformation in reserves of Central Banks. On the one side, European Central Banks are trying to sell some gold in order to engage financial resources to speed up regional economy. “On the other hand, the drop of gold prices makes it possible to purchase at the bottom of those Central Banks, trying to diversify their reserves.” Baronin said. Baronin also added that the purchase of gold is not only a sign of asset diversification, but an attempt to strengthen national currencies, particularly the ruble that could become the region’s single currency. “Russia and Kazakhstan as members of the Custom Union are interested in the strengthening of their currencies as a step ahead to the single currency. On the other hand today Russia is trying to make RUB as the regional currency. This requires strengthening of reserves of Russian Central Bank,” he added. Overall the trend of boosting gold holdings appears a feature of the developing economies, rather than the crisis-ridden developed states. “I think in the middle term we will see a trend – decreasing the amount of gold in reserves of country’s central banks with a developed economy and the increasing of gold shares in the states with a developing economy,” Baronin said.